all the little stories» Blog Archive » my first paper pack. I ran out to IKEA yesterday to get some organizational equipment for our over-stuffed apartment. I took Joshua with me. When I saw this bear, I knew he would be an instant hit, adored by everyone! Joshua agreed and gave the little guy a few cuddles and hugs right away. You love your new little teddy, too. You asked to sleep with him today and even wanted Mommy to take a picture of you with him. He was a fabulous find. Thanks, IKEA! I think it’s really cool that I shot this picture yesterday afternoon and by last night it was already scraped. Wow! That’s a quick turn-around. 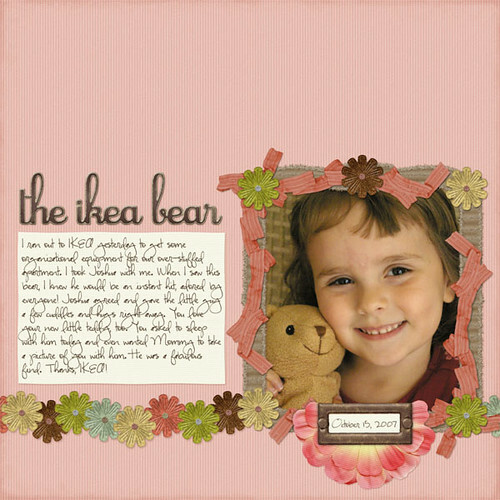 In the course of creating this layout, I actually came up with a freebie to share on my blog! It’s the background paper you see here. I added three more colors and named it Corduroy Kate. I find it highly amusing, though, that it took me a month and a half to finally put up some free paper on Sugarplum Paperie. This is the 22nd freebie! Sheesh. I hope people like it! This entry was posted on Tuesday, October 16th, 2007 at 8:24 am and is filed under just life, scrapbooking, sugarplum paperie. You can follow any responses to this entry through the RSS 2.0 feed. You can leave a response, or trackback from your own site.